Oulehle F., Tahovská K., Chuman T., Evans C., D., Hruška J., Růžek M., Bárta, J. Increased reactive nitrogen (N) loadings to terrestrial ecosystems are believed to have positive effects on carbon (C) sequestration. However, N deposition is usually accompanied by acid (sulphur) deposition. Filip Oulehle (Czech Geological Survey & SoWa) and Karolina Tahovská (Faculty of Science & SoWa) together with their colleagues evaluated changes in C and N pools and fluxes in field experiment (spruce and beech forest) using 3-aers lasting soil acidity and N availability manipulations. 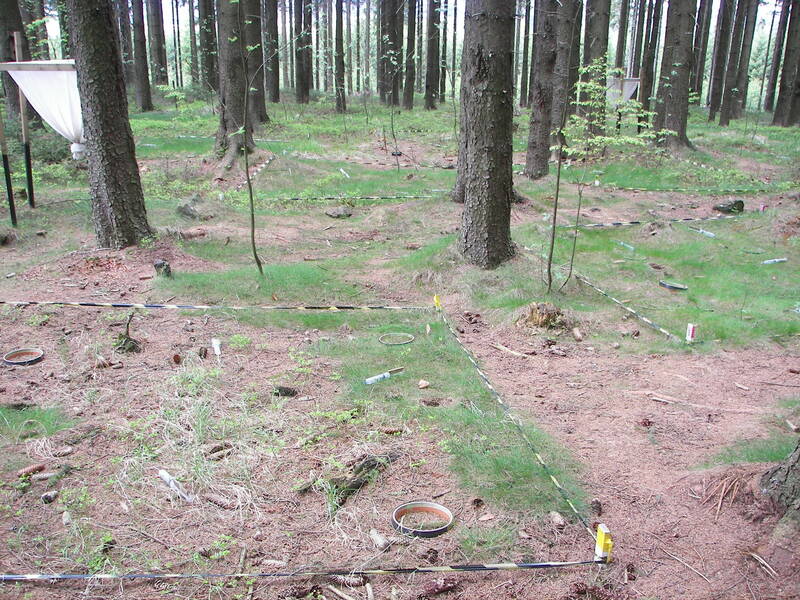 At each forest site, sixteen 3 x 3 m plots were assigned to control, nitrogen, acid and acid-nitrogen treatments in a randomized blocked design. Soil solution characteristics, soil respiration and microbial activity characteristics were determined. Authors showed consistent reduction of soil water DOC driven by chemical changes under acid treatments in both forest types. A suppression of soil respiration by the sulfuric acid amendment was found only in the spruce forest and was accompanied by decreased microbial biomass, increased fungi-to-bacteria ratio and C-to-N enzyme activity ratio. The only changes in C cycling observed after N addition were increased C-to-N enzyme activity ratios with no impact on soil respiration or DOC fluxes in both forests. Authors concluded that C accumulation previously attributed solely to N deposition could be partly attributable to the simultaneous effect of soil acidification.